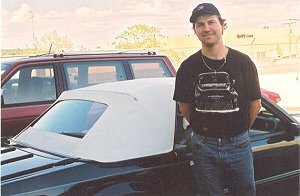 On May 23, 2001 I had the top replaced by Danny Michaelis of Victoria Auto Upholstery. This is the tired old top. I always like to hear about a supplier who does an excellent job and/or goes beyond the scope of usual expectations. Purely by luck, I found out about Victoria Auto Upholstery, and it's owner/operator, Danny Michaelis. My convertible is (in my opinion, anyways) a beautiful car. The top was the only part of the car that was not up to my expectations. It had suffered from neglect, weather and age. The vinyl had cracked and just wasn't the pristine white that it once was. Danny starting to go to work. 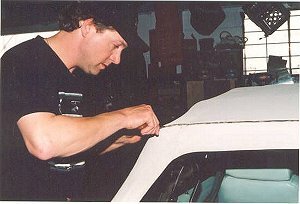 Danny started out working for Tommy's Auto Upholstery and soon was being specified by fussy car owners, as the one person they wanted to work on their cars. After a time, Danny decided that he would be happier working for himself, and opened Victoria Auto Upholstery. I went to see Danny about replacing the top before the Spring Spectacular car show. I was able to book him for May 23rd, after he had completed reupholstering the Budget "double-ended" car for the Victoria Day Parade. Here, he is removing the glass window and panel. Danny quickly determined that the top had already been replaced by the previous owner, as evidenced by the non-factory staples that had been used. He also showed me where the top was starting to de-laminate from the glass backlite. Danny was able to save me some money by repairing this piece, rather than replacing it. 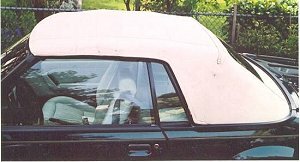 He was also able to paint the outside of the panel surrounding the backlite, to match the colour of the new Oxford White top. Danny standing in front of the finished product. When I got the car back at the end of the day, it was evident that Danny had indeed done a beautiful job. The top looked great and even the underside looked new. He had cleaned up the frame and blown a little black paint on the pads to freshen them up, as well as replacing some screws which were missing from the frame. The only glitch was a crack that Danny had found in one of the major frame components. I obtained a replacement piece from CeeGees Auto Wrecking on the mainland (as well as the Ford-deleted console arm rest, but that's another story). Danny has since then replaced the broken piece and I am now able to enjoy my convertible top in the up or down position. I am a happy man!!! 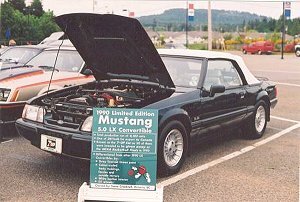 My 7-UP car at the first show of the season - the Spring Spectacular at Joe Cunningham Ford in Parksville. 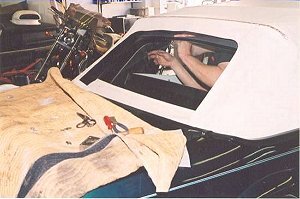 If you are in need of upholstery work or top replacement, I would recommend that you see Danny Michaelis at Victoria Auto Upholstery. He can be reached at (250) 381-4411.